Is your cat a chub muffin? Help your cat lose weight. A cat must lose weight very slowly. Rapid weight loss can cause liver failure as the liver cannot process the fat fast enough. So if your cat is tipping the scales either weigh the cat yourself (baby scales are a great investment when you have small animals) or take the cat to the vet. Once you know the cat’s weight your vet will tell you how many calories a day the cat should eat to slowly lose weight. Since we are not veterinarians we cannot advise you on this. When you know how many calories your cat needs a day call the cat food company and ask how many calories are in their food. They usually are more than happy to tell you. If you are feeding raw look up meat in any calorie counting book for people. If you have just one cat it’s easy. Feed two meals a day. Half of the portion in morning, and the other half at night. If you have more than one cat here’s how we helped Tasha lose 3 pounds about 10 years ago: We picked a room in the house with a door that shuts to be her special dining room. We put her portion of food into TWO BOWLS! Ha! We could tell by the look in her eyes what she was thinking “oh boy, two bowls, twice as much!” Her bowls went into the special dining room, we picked her up and put her in the room and shut the door. Then we fed the other cats in the regular kitty dining room. After 30 minutes we collected their food bowls and washed them out. Then we collected Tasha’s food bowls and washed them out. No more food for any of the cats until the next meal. It took awhile for all of the cats to realize that they needed to eat when the food appeared. After a few days Tasha figured out that she ate in a special room and she’d follow us at feeding time. It took about a year for Tasha to lose the 3 pounds. Her vet was very pleased, and we could tell she felt a lot better. She continued to eat separately for a few more years until we felt that she no longer wanted to pig out on food. One last thought: Before separating her from the others, Tasha used to gulp down her food, then clean up everyone else’s food bowls. But by putting her portion into 2 bowls after awhile she’d leave a few bits behind. Also, not having the competition in the kitty dining room was very relaxing to her she no longer gulped, she ate slowly. When you have multiple cats each cat needs their own food bowl. Set them at least 3 feet apart for privacy and to minimize food competition. If the day comes that your vet tells you that it’s time for your cat to start getting fluids don’t despair, it’s not an automatic death sentence. Many cats live and thrive for many years because of the fluids. You’ve seen photos of our own Three Little Olde Ladies: they get their fluids, they enjoy this ritual, and they amaze their vets with how healthy and happy they are! When you notice your aging cat isn’t grooming or looks a bit greasy, especially near the tail, or you see dandruff, weight loss, and a bit of lethargy, get your kitty into the vet for testing. Because the kidneys are not functioning at 100% and toxins are building up – the cat feels “hung over” which is not a nice feeling. Sub Q fluids will make your cat feel so good that most cats begin to associate the fluids with feeling better and won’t fight you (or your house call vet tech). Think of it as The Daily Love Ritual: The time you spend with your cat giving fluids can be looked at as a time to express love. Pet and massage your cat. Lots of kisses and kind words. A ritual where you hang up the bag, insert a fresh needle, adjust the line, insert the needle, release the brake on the line to let the fluid flow. Stroke the cat, talk pretty to the cat. It can be a relaxing experience for you and the cat. Finding a vet tech: Not everyone wants to administer the fluids themselves which is completely understandable, don’t feel like you must do this. Call every vet hospital around and ask for referrals and interview all of them. Select the one who’s got the most experience but who is also the kindest and has a gentle manner – this is very important. You cat needs to like this person a lot and gentle and loving is imperative. Our vet tech is practically family now! Fluids, lines and needles: The costs of these necessary items can add up fast. Our favorite and least spendy sources are: Brico Medical Supply (www.bricomedicalsupplies.com) and Stat Medical Supplies (www.statmedical.com) You’ll need to fax them a copy of the prescription from your vet. Their prices for cases of fluids is very low, but shipping a case of fluids is costly due to weight, so for you East Coast people use Brico, West Coast people use Stat. Needles: Most needles are now made in China (you know how we feel about that) and the quality can be iffy. The sharpness of the point can vary, and a dull needle causes pain. The only needles we use are Terumo brand. This is a Japanese brand of needle which has an ultra sharp point so that insertion is as painless as possible (our cats don’t flinch at all). 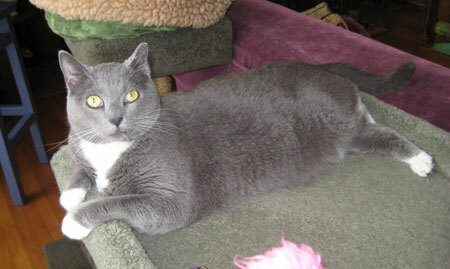 We use 19 gauge which is usually just the right size for a cat – not to big, and not too small. Warm up the fluid bag! : Warming up the fluid bag in a bowl of hot water will warm the liquid which makes the experience so much more comfortable for the cat. 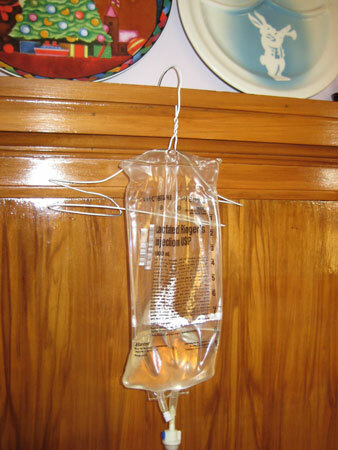 We do not recommend microwaving your fluid bags (or anything else). Usually the bag of fluid is a nice warm temperature after about 10 minutes. Administering the fluids: We find that picking up the cat and moving kitty to a place that’s convenient for our vet tech stresses the cat. Our vet tech goes to where the cat is (usually in a cat bed on the floor or on top of a people-bed). The fluids are suspended from a coat hanger which can then be hung from a window or door frame, bed post, top of a dresser (be creative!). You’ll see in the photo that we bent the ends of the coat hanger, this keeps the bag centered and balanced. Love and Kindness: Kisses and chin scratches while the needle is in and fluids are flowing make all the difference. Gently massage the cat for relaxation and well being really help too (stay tuned for upcoming articles about acupressure massage for cats). The more you pour on the love the more the cat will learn to enjoy getting their fluids. Our’s purr! Diet: Ok, this is going to be a hot potato of controversy. Most vets are saying that cats in any stage of renal failure must have low protein cat food. But our wholistic vets disagree. They say that our carnivorous friends need protein for brain function and to support all other body systems and functions. We were confused too, and therefore we bounced around feeding our cats low protein cat food, then not, and back again. Finally we opted for “what makes them happy and gives quality of life” and that’s protein. But this is purely subjective, ultimately it’s your decision. Do the research, there is a lot of it online. Alternative Support: If you are fortunate enough to have a skilled veterinary acupuncturist in your area your cat will really benefit from treatments. Our cats get acupuncture, homeopathy, and herbs. Our vet is Dr. Cheryl Schwartz who’s book “Four Paws, Five Directions: Traditional Chinese Medicine for Cats and Dogs” is a MUST HAVE! You will learn how to do acupressure massage which you cat will love the feel of, and which will boost health exponentially. Cheryl does not do phone consultations nor does she reply to emails with questions. But if you email us or become a Facebook fan with very brief questions we will save them and in future newsletters publish her replies. Daily Support: Cat Faeries Kidney Kitty helps support the kidney function and kidney meridian with Cat Faeries Kidney Kitty. Our own cats get it every day in their water bowl, even the youngest one who’s 3. Our oldest is 22. Kidney Kitty + Sub Q fluids has our oldest ones feeling pretty darned good and youthful. Meet Cat Faeries new CFO – Chief Feline Officer! After our beloved Betty crossed The Rainbow Bridge a year ago we weren’t sure if or when we’d get another cat. 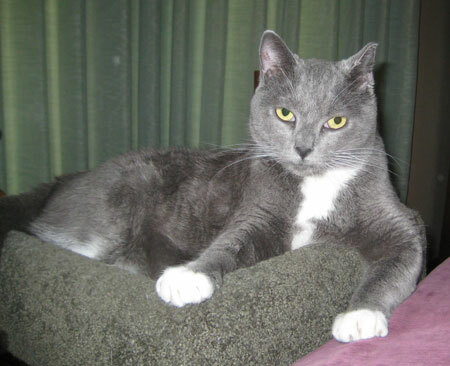 But one look at a cat on the website of a shelter that we donate to – the Siskiyou Humane Society – we were smitten kittens over a cat they called Spice. Spice had been at the shelter for a year. Because she’s a special needs kitty she was not being adopted. Her background is like that of so many cats, she’d been abused. She was kicked in the ear and head by a miserable excuse for human being, which left her deaf in that ear and with some blindness in one eye. Her ear requires cleaning and drops. 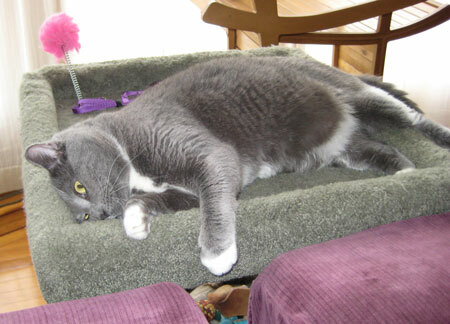 Our home is now her new forever home and she’s Cat Faeries new CFO – Chief Feline Officer. She’s 3 years old, short haired, and mostly gray with white shoes, bib, and tummy. She has lovely green eyes and is a very sweet girl. Spice doesn’t meow – she cheeps, peeps and squeaks! Spice and our Three Little Olde Ladies (Tasha, Spookie and Tortie) are still getting to know each other – so far they’ve been getting along very well. West Hollywood has BANNED the sale of puppy mill dogs! Shops may only sell “cruelty free cats and dogs” and they would be required to offer cats and dogs from shelters! As this news broadcast says, this will send a huge message to puppy mills and backyard breeders across the country! We love West Hollywood because they were the first to ban declawing cats. Since then Los Angeles and San Francisco have done the same. Please share this with your local mayors and city council. Let’s see this ban go nationwide!